We kicked off the feast on St. Nick’s Eve with a nice big dinner, complete with fancy candles. Then it was Christmas PJ’s and St. Nicholas stories on the couch, followed by putting out our shoes. The children were awake at 6:00 am. No surprise there! 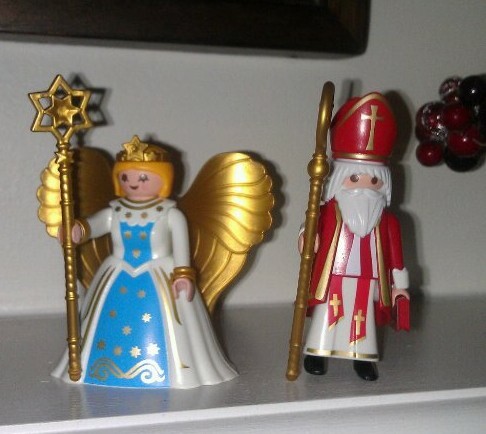 Even Playmobil has gotten in on this tradition! This reminds me of the Kneeling Santa statue my mom always put out in our home each Advent. Dimples showing off her donut ornament. Donuts are her favorite. Each child receives an ornament every year that reflects their latest interests. Then, when they leave home, they’ll have a nice little collection of ornaments to take with them! Until then, they have their own little tabletop trees in their rooms. It was chocolate coins and peppermint candy canes for all before we dove into a big feast day breakfast. Look at St. Nick’s pancake blanket! We can listen to this one in the car. This one is for listening too. And since Mommy and Daddy work so hard all Advent long, doing lots of fun things to enrich their children’s faith, St. Nick brings them a present too! DoStix (as in Dough Sticks) were featured in the November issue of Better Homes & Gardens. I made mention of them to St. Nick, and he delivered! I bake about four dozen butter cookies every Christmas, so these will come in really handy. I can’t wait to try them! 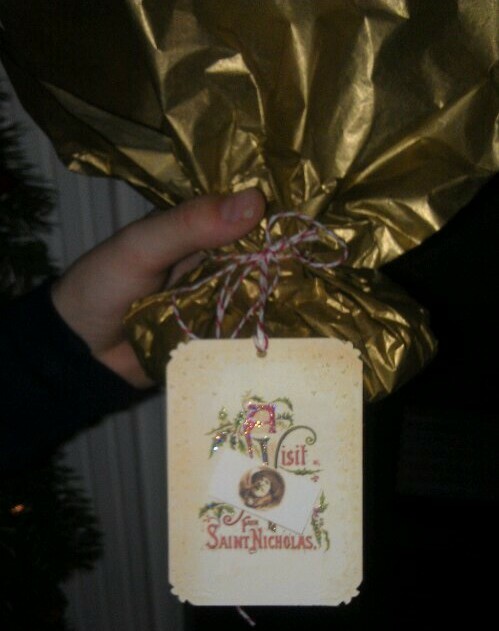 As for The Hubs, well, apparently St. Nick wanted to honor Papa, Irishman through and through that he was. Again, World Market has an amazing ornament collection! And it won’t be long before they all go on sale. Check out their website if you don’t have a store near you. Sign up to be a “World Market Explorer” and they’ll email you all kinds of coupons and $10 off specials. 5 Responses to Happy Feast of St. Nicholas! you really are an awesome mom! your kids are blessed! your creativity and the time and effort you put into these special days never ceases to amaze me! Thanks Kelly! I appreciate your compliment. It’s something I love to do! I love the idea of giving each child an ornament every year to start their own little collection!! I want to do this! Where do you get the table top little Christmas trees?? Hey Gertrud! They usually carry them at Target this time of year. I have also seen them at The Christmas Tree Shoppes they set up in Warehouses in the Northeast. Wish we had those here in VA! I bet you could find one for your little lady now — and it’ll probably be on sale! Check Amazon too.